Protesters took to the streets in hundreds of cities around the world for the 2015 Million Mask March on Thursday, with police arresting dozens in London and activists storming the doors of biotech giant Monsanto in Washington, DC. 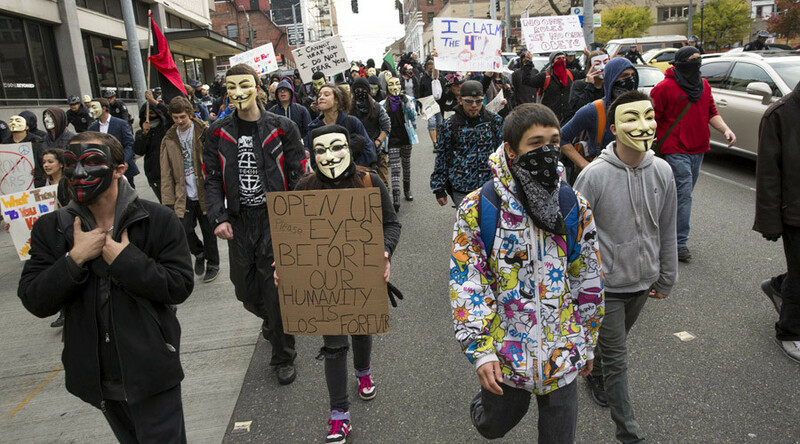 Organized by the hacktivist group Anonymous, the event featured thousands of people from around the world donning Guy Fawkes masks and protesting a variety of injustices ranging from inequality and corruption to police brutality and capitalism itself. Protests spanned the globe, with major events taking place in Europe and the United States, as well as Canada and Guatemala. As in the past, one of the biggest marches took place in London, where hundreds and potentially thousands of people flooded the streets. Although protesters were told to follow a specific route, some broke off from the main group and the scene quickly became chaotic. Roughly 50 people were arrested as a result. According to Sky News, arrests were primarily for public order violations. Three officers were also injured during the day’s events. At one point in the evening, a police car was set on fire, with some demonstrators standing around it, before police finally extinguished the blaze. Smoke devices were also deployed in London. In the United States, protesters marched in events in cities such as New York, Denver, Chicago and Los Angeles. In Washington, DC, activists gathered at locations such as the White House and the Washington Monument. At one point, people stopped to donate money to a homeless man. During one particularly dramatic point in the DC march, protesters tried to rush the entrance of Monsanto’s office. In New York, marchers including numerous Black Lives Matter activists began in Union Square. They protested the officer-involved shooting deaths of Michael Brown in Ferguson, Missouri and others as they took to the streets. The march took protesters past City Hall as well as along Wall Street. On the West Coast, events occurred in cities such as Seattle and Los Angeles. Protesters marched to LA’s City Hall as well as the offices of the Los Angeles Times.